The statics module of LogiKal® can be launched as stand-alone version (independent individual program) or as part of the functions in the Input of Elements. The following text describes the required inputs, settings and possible result outputs of both variants. 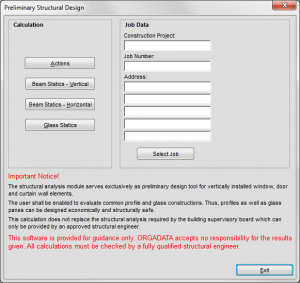 The structural analysis module is used to design beams and glass panes independent from the Input of Elements. Those are automatically saved within the statics job and they can be re-loaded any time. 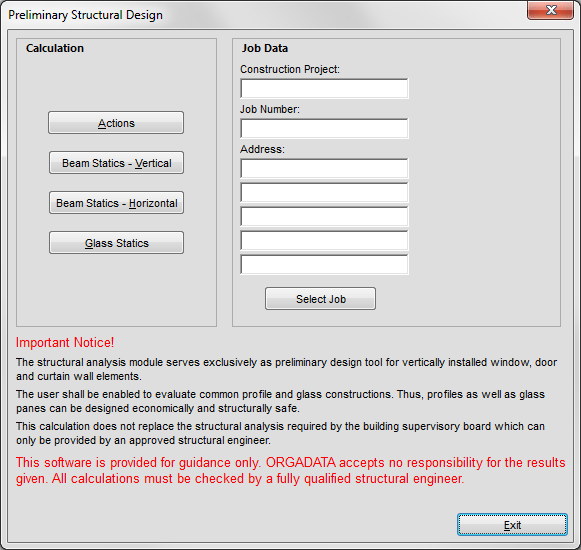 Click the button “Preliminary Structural Design” on the main menu to launch it. Fill out all information about the job first and then click the button “Actions” in order to define loads and limit values. Please pay attention to the notice!